Was Robert De Niro's character, Billy Sunday, a real person? No, he was not a real person. According to the film's press kit, the character of Billy Sunday, who was a Master Chief Navy Diver and instructor at the diving school in the movie, was "a composite of various Navy men." Was there really an enemy sub underwater with Carl Brashear when he worked to recover the nuclear bomb? No, Carl Brashear was not dragged by an enemy sub, nor was there one underwater at all when he was working to recover the bomb. In an interview from About.com, Carl said that the enemy sub was "completely stuck in there." Did Carl Brashear really lose his leg in the same way that the film depicts? Just how bad was Carl Brashear's leg? 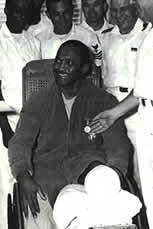 The corpsmen on the ship placed two tourniquets on Brashear's leg to try and stop the bleeding. They didn't work very well at first because Brashear was in such good physical condition and his leg was such a mass of muscle, a corpsman said later in an interview. The lower part of Brashear's leg was not torn off by the accident. He instead suffered several compound fractures of both bones in the lower leg. Then they were going to piece my leg back on and do plastic surgery. Well, they were going to make my leg three inches shorter than the other leg. When they took the bandage off, my foot fell off. So they tried again, and it would fall off. It got gangrene and got infected. Well, I was slowly dying from that. So they transferred me up to Wiesbaden, Germany. There the doctor said that he could fix me, but it would take three years and could have me walking on a brace. So I raised all sorts of hell in that hospital. So he said, "Well, do you want to be air-mailed out to the States?" That's the term he used. He said, "Do you want to be air-mailed out to the States?" I said, "Yes, sir! Air-mail me out of here!" Why did Brashear eventually choose amputation over trying to save his leg? What type of tests did Carl Brashear have to pass in order to remain an active U.S. Navy diver? Carl Brashear had to pass a variety of strenuous physical examinations. One exam involved climbing a ladder with a set of weights strapped to his back equivalent to the weight of two scuba tanks. Eventually, after prolonged tests and diving exercises, Carl was put back on active duty. He stayed on active duty for 12 more years, and in 1970 Carl became the first black US Navy master diver. Did Carl Brashear really split up with his wife as the movie implies? Yes. He and Junetta Wilcoxson divorced in 1978 after a 26-year marriage. In the years to follow, Carl Brashear remarried twice, but divorced each time. The last marriage ended in 1987. In this school project, several students offer an honest look at the real Carl Brashear's life, which is portrayed onscreen by Cuba Gooding Jr. Watch video, see photos and listen to him speak about his life as a Navy diver. 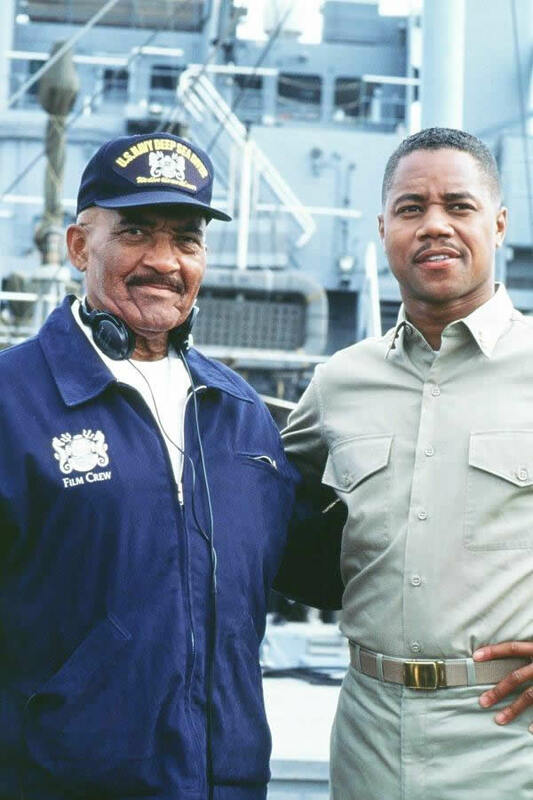 Pictured left is Carl Brashear and Cuba Gooding Jr. on the set of 20th Century Fox's Men of Honor. Carl served as a technical advisor on the film. Pictured left is a modern day U.S. Navy diver from Mobile Diving Salvage Unit Two. 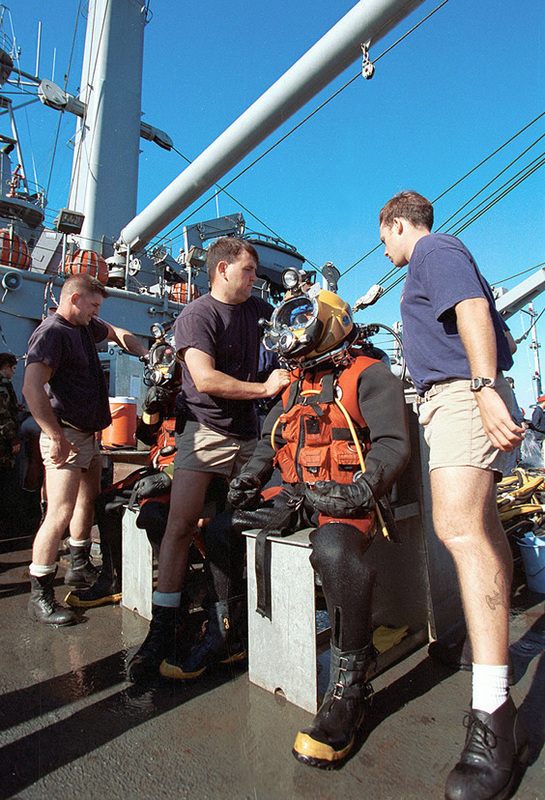 The divers prepared on the deck of the USS Grapple (ARS 53) to dive on the crash site of Swissair Flight 111 off the coast of Peggy's Cove, Nova Scotia, on Sept. 13, 1998. U.S. and Canadian forces worked together in the retrieval of victims and aircraft debris from the crash site. 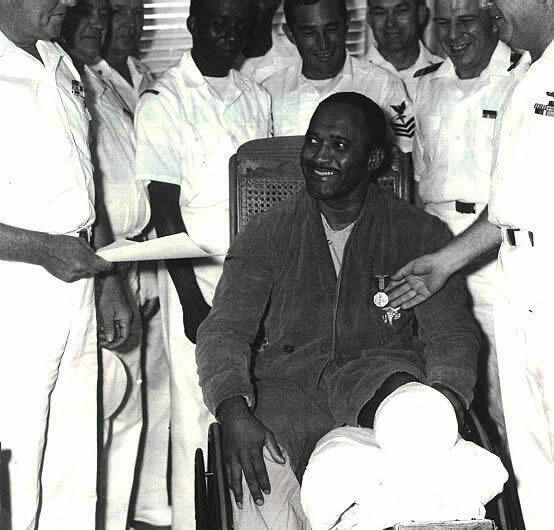 Carl Brashear's Personal Data, Transcript of Service, Medals, Etc.